The other shoe may be about to drop on Israel. Egypt is introducing a resolution at an IAEA meeting in September, which will call on the international regulator to monitor Israel's nuclear program. Iran is likely to join the resolution. And while the resolution would not be binding like a Security Council resolution, it would certainly cause diplomatic embarrassment to Israel. A senior Foreign Ministry official said he feared the recent nuclear deal between Iran and the six powers will make it hard for Israel to defeat the resolution. 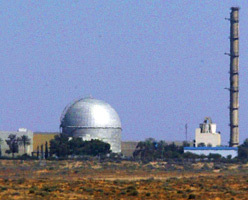 The resolution, titled “Israeli nuclear capabilities,” has been repeatedly proposed by Egypt in recent years. It condemns Israel, demands that it open its reported nuclear facilities to IAEA inspection, and calls for an international conference on making the Middle East a nuclear-weapons-free zone. For the last three years, Israel has succeeding in mustering a majority against Egypt’s IAEA resolution, thanks partly to proposals for a direct regional security dialogue with Arab states under UN auspices. Egypt and various other countries rejected these proposals, but they earned Israel considerable international credit. The campaign to thwart the latest resolution began two weeks ago, when the Foreign Ministry sent a cable to all Israeli embassies and consulates instructing them to urge their host governments to oppose it. Israel has also sent personal envoys to several countries it considers key to winning the vote. For instance, former Foreign Ministry director general Nissim Ben Shitrit went to Argentina about 10 days ago, on the assumption that if Argentina doesn’t back the Arab proposal, other Latin American countries would likely follow suit. Senior Israeli officials are divided over how the Iranian deal will impact the IAEA debate. Some argue that following the Iran agreement, America and other leading countries won’t want to raise the pressure on Israel even further. But others fear that with the Iran deal done, the international focus will shift to Israel’s nuclear program. They also fear Israel will enjoy less American support than in the past, due to the severe tensions with Washington over the Iran deal. I hope that the 78% of American Jews who voted for this administration are pleased. Surely they will still have those smirks on their ugly faces when - God Forbid - as Mike Huckabee said last week, Israelis are led to the ovens. seems to be a joke.